I started at 120 pounds and weighed 176 at the end. I gained 56 pounds. I started at 130 pounds and currently weigh 182. I've gained 52 pounds, but really 62 since I want to be back at 120. Why oh why do I gain so much weight when I'm pregnant? I've honestly tried eating better this time. I've only made one batch of brownies instead of dozens and I've been chasing a toddler around the entire time. Hopefully I'll be able to lose the weight pretty fast like I was able to with Fox - but it wasn't easy! I was on Weight Watchers and exercised regularly. Here's to hoping breastfeeding is my best friend and that Lean Cuisine meals fill me up! I think you are still absolutely beautiful! Because you're pregnant! Your body is holding on to nutrients to be sure it can nourish your baby Jane even if you suddenly get hit by a famine!! You look beautiful and healthy. Don't worry, the weight will come off if you exercise some and eat healthy. And breastfeeding definitely helps!! that comment above was from me, Laurie, got mixed up with my daughter's account, ha! you look gorgeous!!! It's so hard to see that when you're the one gaining the pounds, but trust me you do! I think that your hair looks really pretty straightened! And the pounds will melt off while you are nursing. I saw 180 during my pregnancy. Trust, me, I feel you. The kiddos make it all worth it. Hugs! You are such a beautiful mother. Slimming down after pregnancy is not easy, but we know you can do it. More before-and-afters! You look great pregnant! and not pregnant too. No need to worry! You look so pretty!! 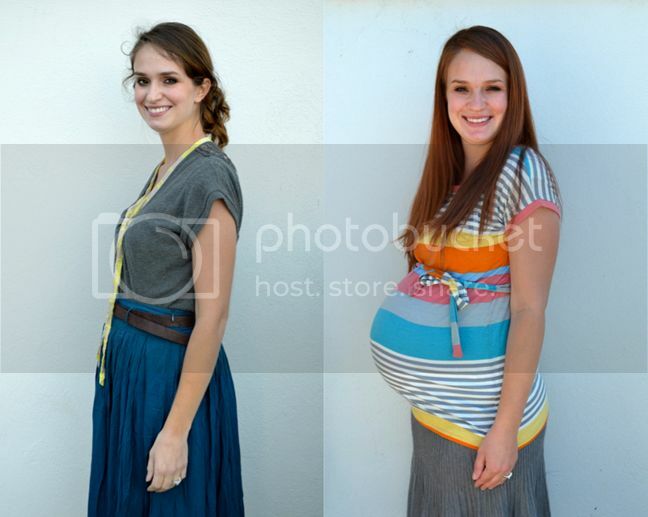 Don't dwell on your preggo weight...I'm sure it will come off. Even if it doesn't you still look fantastic. As soon as saw this title it made me laugh! Funny :) you really DO NOT look like you weigh 182. you look amazing. And I'm not just saying that to be nice girl. you really look great! You are GLOWING. You're gorgeous. Don't even think twice of the #. I did exactly what you did & lost it FAST. You will too! BUT to me, you look like you have NOTHING but that sweet baby girl bump there! You look so pretty! And I love your top :) just remember it's just a number! i am absolutely floored that you've gained that much because your pictures do not tell the same story at all! i think you should have posted the before and have pictures and weights for fox and then just posted pictures for jane and had us guess the weights. you look super cute and you make me excited for a bigger bump! you look sooo adorable!!! I totally wouldn't worry!!! gotta love pregnancy.. LOL!!! I was about 120 with Edward in the beginning and gained about the same as you. But the great thing about nursing was that all the pounds fell off! You are beautiful! It is fun to see these comparison photos. Take it easy on yourself about the weight. It will all work out :) Wishing you all the best for baby Jane's arrival! You're adorable no matter what! And such a snazzy taste in clothes! Cute!! Oh, what a sweetheart! I just saw what you're hubby wrote. You'd better hang on to that one, girl! But I have to agree! Pregnancy may make us a bit miserable and depressed with all the weight gain and anticipation, but hang in there, it'll all be worth it soon enough. Sending you hugs! Run to the window and catch them! 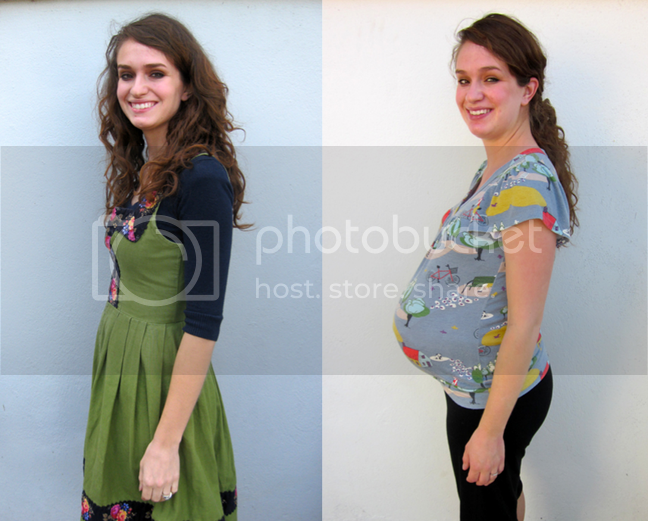 I love your striped shirt at 38 weeks. Where did you get it? Your pregnancy weights are my goal LOL, and I too gained 60 with my last child... what do you do right? Can't wait to see that little girl!